Israel's primary airport to be shut down during Shabbat following plans to tax airports authority. 28,000 passengers to be affected. Workers at Israel’s largest airport announced Tuesday afternoon plans to shut down operations for incoming and outgoing air traffic as part of a general strike. 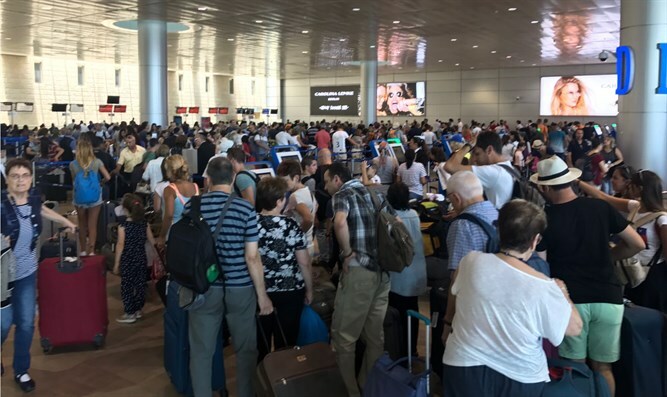 A union representing Israel Airport Authority workers declared a strike at Ben Gurion Airport for this coming Sabbath, shutting down all operations from Friday evening until Saturday night. The union declared the strike in response to plans by the Interior Ministry to levy property taxes on the IAA. Interior Minister Aryeh Deri recently appointed a committee to deal with the matter, in the hopes of raising additional funds from the IAA for the benefit of surrounding towns. If the threat to strike over the Sabbath is carried out, it would affect nearly 180 flights and 28,000 passengers. But union chief Pinchas Idan blamed the Interior Ministry for the planned strike, saying that it was placing the IAA in an impossible situation. A spokesperson from the Interior Ministry Idan’s claims and decried the planned strike.